Tanks designed and produced by Imperial Japanese Army and the Japanese Self-Defense Forces. Japanese Tank was introduced in World of Tanks update version 8.10. Currently, there is one end-tier medium tank line (two branches until tier 5 with mediums and light tanks) and heavy tank line. Althrough Japanese heavy tanks greatly differs from Japanese medium and light tanks, they all share few similarities; All Japanese tanks have great gun depression, (with exception being Chi-Nu Kai and some heavy tanks that have limited depression above their miniturrets), lack of sloping on armor (except on tier 8 - 10 medium tanks), and good firepower. Japanese medium and light tanks have few more things in common. They all have poor armor thicknesses, however, higher tier mediums (most notably the STB-1) have sloped armor, which may result in lucky bounces. They also combine good gun depression with guns that have excellent penetration and a good balance between alpha and ROF. In the first few tiers, the Japanese tanks can seem to prove to be a real turn off. Guns have generally average accuracy and handling. Most Japanese medium and light tanks have decent camo values for their class. At tier II, the line splits between medium tanks and light tanks. Japanese light tanks offer good speed and agility, culminating into the Type 5 Ke-Ho, which is small, fast, agile, and packs a surprising punch. However, to balance these overall good characteristics, the three light tanks in the Japanese line lack in armor even more so than their medium counterparts, and are not exactly specialized for active scouting in general. In the diverging medium tank line, agility is traded for additional firepower and flexibility, a shining example being the Type 97 Chi-Ha, which while albeit cumbersome, possesses great firepower and accuracy for its tier, which enables it to play not only as a support medium but also a tank destroyer. The Medium tanks, along with their light tank cousins, are somewhat lacking in armor overall compared to their international peers. 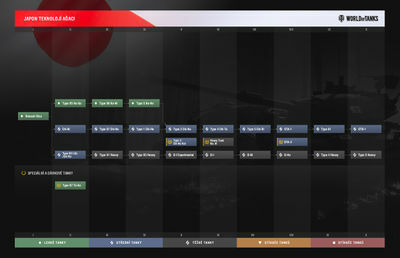 At tier V, the medium and light tanks lines reunite, and the Japanese tank line focuses solely on mediums which have decent damage output as the line reaches later tanks, all of which have the capability to switch roles seamlessly when required. Past tier V, the medium tanks take rather wild variations between tiers. The tier 6 Chi-to is known for its overall good maneuverability for its size. The tier 7 Chi-Ri is notable for its very large size, rivaling the bulkiness of the German tanks found in the E50M line, being even bigger than some heavies of its tier, which makes it an enticing artillery target. Yet to trade for its large size, the Chi-Ri has the ability to equip a dangerous autoloader. In addition, to compensate for these wild variations, all of the late-tier Japanese tanks feature above-average to good health pools, some rivaling those found along the E50M line as well. In the last few tiers, the turrets of the Japanese tanks, while not greatly increasing in armor thickness, begin to become well-rounded and sloped like their Chinese counterparts, the STB-1 for instance has among the shallowest sloped turrets in the game, able to bounce nearly any shot. They also likewise have cramped modules and crew. However, in contrast they still retain their excellent gun depression but also abysmal hull armor. In essence they are not jack-of-all trades and masters of none like the Russian Mediums, but are extremely potent as second line support tanks, and if handled properly can even take on primary roles in a pinch, if only temporarily. Overall those who expect to see Japanese medium tanks brawl effectively will be generally disappointed and surprised, as all of the tanks in the Japanese medium line lack strong armor found in Russian and German tanks that will be sufficient for such. However, those who prefer a supporting role, sniping, flanking, etc. will very much enjoy what the Japanese mediums have to offer. Other than few similarities mentioned earlier, Japanese heavy tanks are nearly polar opposities of medium tanks. They generally have terrible mobility , flat but extremely thick armor (After tier 5), its ammo rack is easily damaged or exploded with few side shots, its gun offers powerful HE rounds and huge alpha damage but takes a long time for reload. Japanese heavy tanks lacks real weakspots on front, but at cost they are much worse at angling than their German counterparts due to either terrible side armor or having weak cheeks on front that becomes easily penetratable when angled. They are also the biggest tanks in the game, being notably bigger than even the Maus, making them very easy targets from artillery. They're also known for great module compatibility and don't require new turret or suspension to improve performance, making the Japanese heavy line fairly easier to grind than others tech line in the game. The Low tier Japanese heavy tanks, The Type 91 and Type 95. Had design that resemblance with French interwar tanks (example, The Char B1). Unfortunately, these suffers from poor mobility and lack of protection (Both of them have weaker armor even than Light tanks in the same tier). However, they're armed with decent "derp" gun that offers powerful HE (its HE had more penetration values than AP, which is unusual) that can be crippling against most tanks in the same tier. From tier 6 and above, Japanese heavy tanks are generally quite similar: they have option of two guns (either 15cm howitzer, or mid-calibre gun with decent damage but somewhat lowish accuracy and penetration), have very tough frontal armor with few weakspots, are gigantic, have poor mobility, generally poor side armor and very high health pool. The infamous O-I is capable of oneshotting most same tier tanks and is unique due to having sturdy rear armor thicker than a few peers' upper glacis, but it has extremely long reload on its 15cm gun. O-Ni carries similar guns but has notably improved soft stats, health, acceleration and frontal armor, as well as new 10cm with higher penetration and damage. O-Ho is notable due to its exceptional RoF on both guns, but has limited gun depression on front due to miniturrets. At tier 9-10 position, The Japanese heavy tanks have renewed design. They receive completely new gun choices with notably higher alpha damage. The Type 4 Heavy loses miniturrets from its predecessor and gained much stronger side protection, making angling a more viable option, but suffers from even worse mobility (generally because the massive weight increase while retaining the same engine) and hull cheeks that limits angling ability. The apex of Japanese heavies, Type 5 Heavy, has much tougher side armor and hull cheeks no longer being outright weakspots, meaning that it can finally sidescrape effectively, something that earlier Japanese heavies could not. The Type 4 and 5 has two gun options; the 14cm gun that offers high alpha damage and decent handling, for stable damage output; or the 15.2cm gun that sacrifices RoF and accuracy for extremely powerful HE shells with the greatest potential alpha damage of all heavy tanks in game (Comparable with SPGs). This page was last modified on 5 October 2018, at 10:09. This page has been accessed 634,200 times.